Your small business brand is central to everything you do: It defines how you present your company, products and services to the world. Or, even better, to your ideal clients. So if you’d like to find out what a small business brand is all about, why you need one and how you can create yours, read on! What is a small business brand? Whether you’re selling products or services, targeting people like you and me or businesses – the choice your potential customers have is often vast. Regardless of your market and industry, one of the main purposes of your marketing is to make your small business stand out from the crowd, to be memorable. But for that to happen you need a well-defined identity and you need to be consistent in using it. The way to do that is to define something marketers call “the look and feel” of your small business: Your brand. 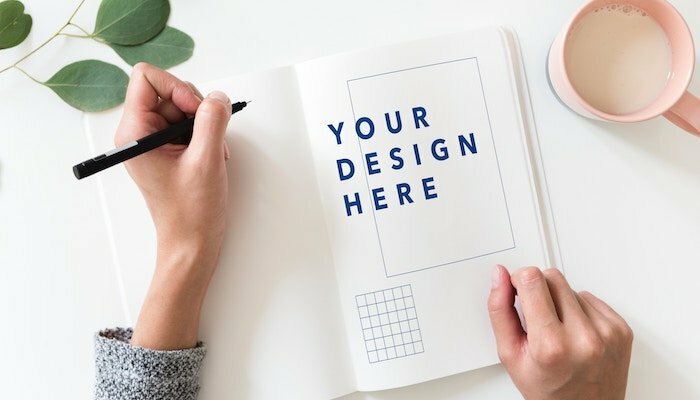 To give you all the information you need to create your own brand, you also take elements from your marketing strategy into account, mainly your unique selling proposition (USP) and your ideal client. Find out how to define your small business marketing strategy and create your USP. And all that taken together has a direct impact on how your marketing looks and sounds. The colour and overall design scheme is the guideline for everything from your shop or office décor, company leaflets, signage, business cards to your website. Your tone of voice together with your brand personality and values strongly define the language and wording of your communications. Having a visual identity helps your business to be memorable (for the right things) and to appeal to the right people. That in itself is the main benefit of having a well-defined small business brand. Additionally, having a clear set of values, personality traits and a mission statement help create a collective vision for everybody on your team. Your brand strategy will prove to be a handy guideline for your whole marketing: Need a new website design? Your branding will be an ideal brief for the designer. Working with a freelance copywriter? Only if they understand your brand are they able to get your message across. So, where to start when you want to create your small business brand and give the market a clear signal that you are a force to be reckoned with? Let’s have a look! How do I create mine? Let’s start with the easy bit: Write down who you are and who you aren’t. Describe the nature of your business and what your company’s personality is like. Are you upbeat and fun or more quiet and relaxed? Do you want to convey a feeling of security and support or are you a straight-laced, no-nonsense kind of business? Next, ask yourself what values do you represent, and why? What things or causes are close to your heart and the core of your small business? For example, if your reason for existing is to help dog owners understand their pets better by providing training and coaching, write that down. Are you all for protecting the planet and running your company as environmentally-friendly as possible, there’s your set of values right there. All this forms a picture of what you and your small business are about and the more this is reflected in your brand, the more like-minded people will be attracted to it. Use this information as a briefing for a graphic designer to help you visualise your brand with a logo, colour scheme and overall brand design. Knowing who you want to do business with is a vital part of your small business marketing strategy and your brand. Think about the characteristics of your target audience: What do they like and dislike? What are their priorities, what do they want and need? Try to find out everything about your their values and what triggers them to search for your products or services. Additionally, look at what your competition does and identify things you do better or differently. Who are they targeting and what makes them stand out? Now consider the whole marketplace your small business is in: Where do you stand and which niches are your competitors occupying? What is their slogan or value proposition and how can you be different? How can you carve out a niche for yourself? Use your niche to create your slogan or tagline and give a clear message to your ideal clients why they should buy from you and no one else. Take both of these definitions to figure out what your tone of voice should be. Make sure your message reflects your small business’s personality and attracts potential customers. When you have your brand together don’t forget to give it a little test run. Show it to people you know and don’t know, people who know about your business and the ones who never heard of it before. Find out what impression they get from your visual identity and who they think it would appeal to. It’s a safe way to check if you got it right before getting everything designed and printed.